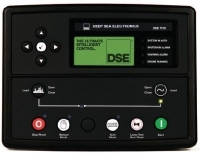 The DSE7510 is an Automatic Engine ControlModule, designed to provide advanced load share functionality for diesel and gas generating sets that include nonelectronic and electronic engines. The module also provides excellent engine monitoring and protection features. The module’s load share functions include, automatic synchronizing with built in synchroscope and closing onto dead bus. Direct and flexible outputs from the module are provided to allow connection to the most commonly used speed governors and automatic voltage regulators (AVRs). The module has been designed to combine a maximum of 16 generators and 16mains (utility) supplies up to a maximum of 20 in one system, e.g. 16 generators and 4mains (utility) supplies (DSE7560 required to synchronise with the mains). The module has the ability to monitor under/over generator volts, over current, under/over generator frequency, under speed, over speed, charge fail, emergency stop, low oil pressure, high engine temperature, fail to start, low/high DC battery volts, fail to stop, generator short circuit protection, reverse power, generator phase rotation error, earth fault protection, loss of speed signal, fail to open, fail to close, out of sync,MPU open circuit failure, negative phase sequence and loss of excitation.